Do you ever slam your car door shut only to realize moments later that your keys are still in the ignition? Us, too. You’ll need a reliable, close-by auto locksmith in Brooklyn, NY to help you with this one. We have over a decade in business in Brooklyn, NY, so you can be sure that our auto locksmith team is dependable and give you the best possible car locksmith service anywhere in Brooklyn, NY. We have promised a 20 minute response time from our fully loaded van to help you with everything from auto lockouts to copy vehicle key services. Call us today and we’ll send one of our honest and friendly techs to you. Eddie and Sons Locksmith - Auto Locksmith in Brooklyn, NY to Perform Key Services? We’ve got you covered. Our locksmith service in Brooklyn, NY team can help make any kind of replacement car keys. Chances are, you keep all your keys together, jangling in your pocket or purse. So, when we lose one, we usually lose them all. That’s no problem for us. Our auto locksmith Brooklyn, NY will send a van to you with a key maker to replace anything from a regular key to an ignition key, and even a transponder key if you need. Call one of our helpful locksmiths in Brooklyn, NY to make new car keys. Whether you lost yours or just need copies, Eddie and Sons would love to be of service to you. Most vehicles these days use a transponder key instead of traditional keys. That’s why it’s important that as your auto locksmith Brooklyn we’re able to make any car key that you might need replaced. You’ll give us a call, we’ll send a van right to you, our trusted transponder key maker will do any key job, and soon you’ll be on your way. Did you lose your fob too? No worries, because we can get you a new key fob as well. When you need transponder keys for your car, you’ll know to call us, your local car locksmith Brooklyn, NY for all your car key replacement and fixes. We have the right key maker for you. We take our cars everywhere, and sometimes our car keys get left behind and you’ll need some help getting replacement car keys. Or perhaps you need a copy of a vehicle key for your wife. 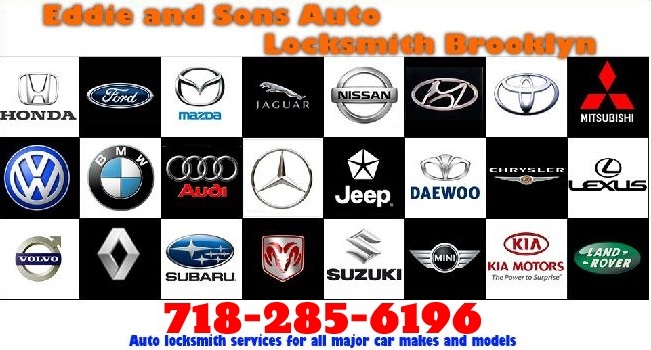 For whatever the reason, we are the auto locksmith Brooklyn you can call when you need replacement car keys. We can replace just about any type of key. We are the premier auto locksmith Brooklyn, NY has to offer and we can create an ignition key for you in no time. An ignition key is complex in that it sends electronic messages from the key to the engine starter. But you’re in luck because it’s no match for our ignition locksmiths. There is no other locksmith like us anywhere in Brooklyn, NY!